Unfortunately, there are many species of rays and skates that are considered threatened and endangered. One example, the common skate (Dipturus batis) is now considered critically endangered by the World Conservation Union (IUCN). In fact, the IUCN Red List includes 547 species of elasmobranchs of which at least 20% are in danger of extinction. 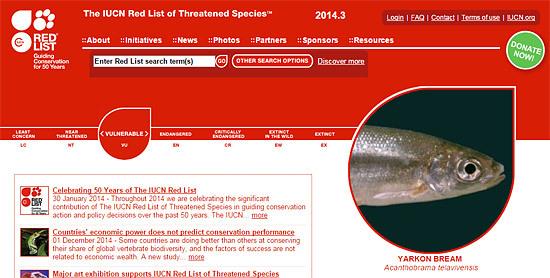 Click on the image below for more information about the IUCN Red List. There are many ongoing or recent studies and research initiatives looking at the life history of rays and skates. These studies will assist governmental agencies with fisheries quotas and conservation policies in regards to these animals. The Florida Program for Shark Research is tagging and tracking rays in some of the waterways along the coast of Florida. The data from this project will assist in the identification of daily and seasonal movements of the tagged rays within these waterways. In addition this study will allow us to compare the movements of pelagic (cownose rays and spotted eagle rays) and benthic species (bluntnose rays and smooth butterfly rays). Water quality measurements recorded at monitoring stations on a regular basis throughout the year will be used to determine if the rays’ movements can be correlated to environmental cues. The Pacific Shark Research Center (PSRC) at Moss Landing Marine Laboratories in California is involved with studies on the reproductive biology of skates and the feeding ecology of rays and skates in the Pacific Ocean. Research at the PSRC also includes reviewing the taxonomic classification of skates. At the Virginia Institute of Marine Science, biologist are investigating the age and growth of a skate species that has declined more than 95% due to take as bycatch in the groundfisheries (New England). Data collected will assist with the governmental prepartion of the “Skate Management Plan”.